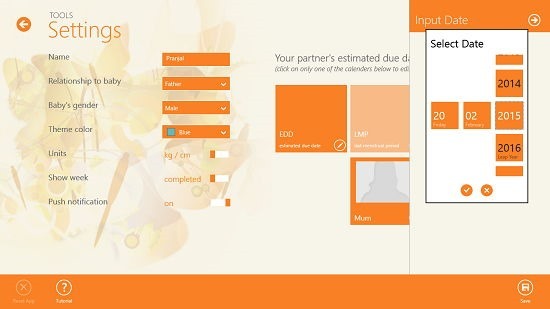 Pregnancy Plus is a free app for Windows 8 and 8.1 which allows you to keep a track on your or your partner’s pregnancy. The app allows you to view stuff like the expecting date for the baby, cycle resume dates and a lot more by simply entering the date when she is expecting. The app is a great way to keep track of your baby, if you are a new parent. 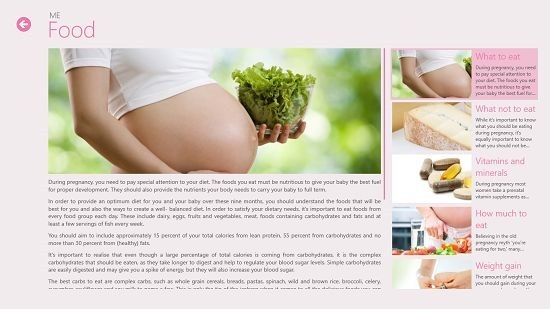 It will also tell you about the various foods that the mother can have during the entire period, tips to help her through the phase, mood swings and how to keep them from taking over her mental frame, etc. You can also plan doctor appointments etc. in the app itself. The app has a clean interface and makes for a great experience. 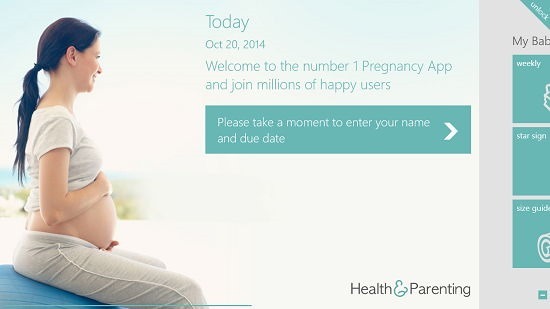 Pregnancy Plus is a free app which can be downloaded off the Windows App Store. When you launch the Pregnancy Plus app on your device, you will be presented with a beautiful interface wherein you can go ahead and enter your name, relation with the baby (father or mother), etc. This interface is shown below. Simply click on the blue tile to get started. When you click on it, you will be presented with a screen which looks like the below screenshot. In the above screen, you can set your name, relation with baby etc. You can also set your gender, and do stuff like setting the expecting date which is vital in setting up the app. To set that up, click on the EDD tile in the above screen. Once you have set the date, the app automatically calculates the other dates for you (if you are the mother) or for your partner if you are the father. Click on the back arrow button at any time to go back to the previous screen. If you scroll to the right in the main screen of the app, you will be presented with an interface where you can read about recommended foods, etc. by clicking on tiles which correspond to the same. For instance, clicking on food will present you with the below screen. 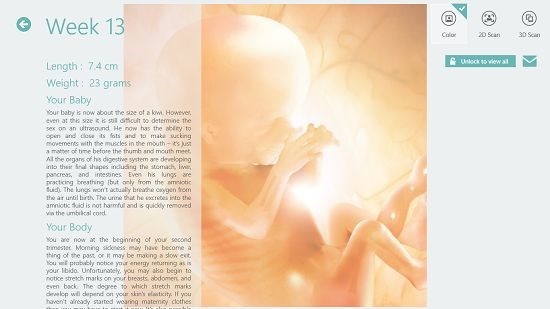 You can also see your baby’s development week by week (scans of the baby, well not your baby, but it will give you a brief idea about how the baby looks like in the womb). You can see the baby scan of Week 13 shown below. You can switch between Color images, 2D scan or 3D scan from the top right corner. 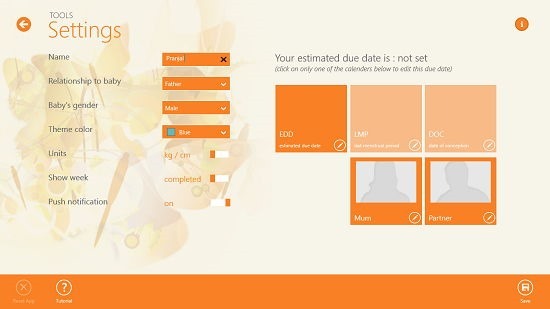 In the main screen, you can also go about scheduling doctor’s appointments etc. It isn’t really possible to talk about all the features of this app as it’s simply so versatile, but let me tell you this – the app is extremely user friendly and you’ll have no issues whatsoever using it on your device! This wraps the app’s main features. Pregnancy Plus is a great app which enables you to read about babies, and is an absolutely vital source of information for new parents or expecting mothers. I rate the app a 5 out of 5!